Nothing is better than holding your newborn baby in your arms. Feeding, snuggling, and holding your new tiny person are some of the most crucial things you can do to forge strong bonds. When it comes to things like breastfeeding and bottle feeding, it isn’t always easy to find a comfortable position. This is what is great about the Boppy Pillow, not only does the Boppy Pillow support you, it has a variety of other uses to support baby too. So What Is a Boppy Pillow? A Boppy Pillow is a semi-circular cushion that supports your little bundle of joy. It can be used by nearly any body type during feedings and has a multitude of other uses as your little one grows. The Boppy Pillow covers come in a variety of adorable prints to suit any new parents taste or nursery decor. 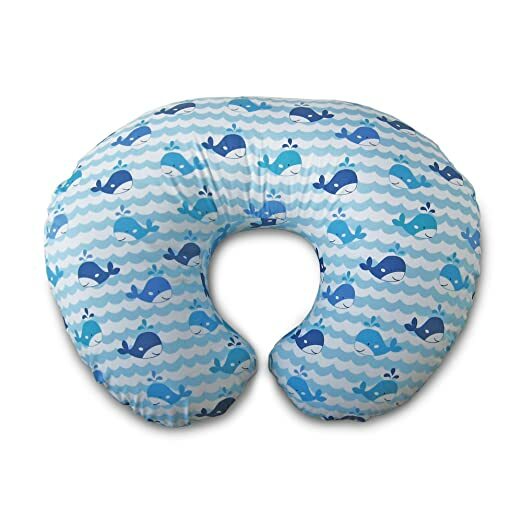 Click here to see one of the best selling Boppy Pillows on Amazon. The Boppy Pillow is one part cushion, one part cover, and one part hug. The outer layer or cover comes in a variety of materials. The covers for Boppy Pillows come in cotton, microfiber and even material that is a hypoallergenic and water resistant. Multiple covers can be purchased and used over the same pillow (at different times of course). Both the cushion and cover are durable and machine washable. The Boppy Pillow offers a great deal of support by providing a raised and padded surface for baby to lay on. This makes it vastly more easy to nurse and bottle feed. By placing the Boppy Pillow around your waist and letting it rest on your lap, you are able to sit in much more ergonomic position when feeding baby. The Boppy Pillow can prevent both neck and back strain, which can be a total pain in the neck. Do you have more babies than you do arms? Are you a parent of twins or multiples to be? The Boppy Pillow makes a great prop for the football hold when feeding multiples. The Boppy Pillow is also great for some extra support when holding those sweet babies. Gazing into your baby’s eyes while they smile at you is an amazing sight. At about 2 months you can use your Boppy Pillow to prop up baby on a gentle incline. Not only can you watch your little one kick and bat their tiny arms and marvel at their cuteness; these motions are actually working those tiny muscles preparing them to start reaching out for toys or even your hand. The Boppy Pillow makes a great accessory for tummy time starting around 4 months. Building strong muscles is an important skill for your little one to master as they grow and prepare to take their first steps. But before baby can walk they need to know how to crawl. Tummy time using a Boppy Pillow makes for a comfortable cushion for baby to strengthen those crawling muscles. The Boppy Pillow can also be used as an aid when your little one is learning to sit at around 6 months. By supporting babies back and creating a barrier on either side, the Boppy Pillow keeps your weebly wobbly little one propped up safely. The Boppy Pillow can help reduce some of the unavoidable topples as baby is learning this new sitting skill. Being a parent is hard work and very time consuming. With the addition of a new little one comes all types of messy accidents; spit up and other messes become a daily part of life. All parts of the Boppy Pillow are machine washable. Machine washable baby gear is a welcome perk to parents who are too tired to even remember the day of the week. Simple common sense can make sure you keep baby safe. Like with many baby products, the Boppy Pillow is not meant to be used without parental supervision. Why Do You Need a Boppy Pillow? The Boppy Pillow has been around for over 25 years and has a great reputation for supporting parents and babies. From aiding with your newborn feedings to reaching all those new milestones, the Boppy Pillow has so many uses. The Boppy Pillows allow parents to be more comfortable during feeding and aid in babies important muscle development helping your tiny person reach those important milestones.